England pulled off a great escape on the final day of the opening Ashes Test against Australia, with tailenders James Anderson and Monty Panesar earning an unlikely draw in Cardiff. The hosts’ final two batsmen held out for 11.3 overs late in Sunday’s final session, holding out long enough to deny Australia the chance to bat again and score what would have been a small amount of runs for victory. Anderson made a defiant 21 while No. 11 Panesar defied all expectation by lasting 35 deliveries to be unbeaten on seven as England reached 252-9, a lead of just 13 runs. They left the field at 6.41 p.m. to a mass standing ovation, having added an invaluable 19 runs and frustrated the bowlers as the match finished in a thrilling draw. The English had slumped to 233-9 when Paul Collingwood finally fell for a valiant 74 off 245 balls, having earlier added a vital 62 with Graeme Swann, who followed up his first-innings 47 not out with a much more dogged 31. The Australians were left disappointed, having compiled a mammoth 674-6 then taken two wickets late on Saturday to have England staring down the barrel of defeat at 20-2 and still 219 runs away from making the tourists bat again. “I am disappointed we didn’t win the game, I thought we played well enough over the five days,” said Australia captain Ricky Ponting, who was named man of the match for his superb 150. “But I am still really proud of the boys. We can take a lot of heart out of the game although we came up a bit short in the end. Give England credit as well. “There are four Tests to go and we will have to play at this level if we want to win the series. I am happy with the way things went with the bat but I have a bitter-sweet taste in my mouth.” England captain Andrew Strauss was relieved to have escaped with a draw ahead of the second Test at Lord’s. “All day we were not quite in the contest. We lost wickets early on but all credit must go to Paul Collingwood, he was outstanding,” said Strauss, who was the first of spinner Nathan Hauritz’s three victims when he was caught behind for 17 as England teetered at 46-4. “He does it time and time again for us in pressure situations. I can’t say enough good things about him. Also we have to mention Jimmy and Monty. The batsmen shouldn’t have let them get in that position, but they showed a lot of character. “They kept their heads, and in a pressure situation that is hard to do. We are proud of them and we are proud to get a draw, but we are also aware that we have a lot of work to do between now and the second Test. “We’ve not given away too much momentum, which is important in back-to-back Tests. We are just very, very thankful to get a draw and we can take pride in the fight we showed.” England lost key batsman Kevin Pietersen for eight when he was bowled by Ben Hilfenhaus within 20 minutes of the start of play. From 31-3, Strauss soon departed and Matt Prior was caught by Michael Clarke at slip for 14 when he tried to cut Hauritz half an hour before lunch. 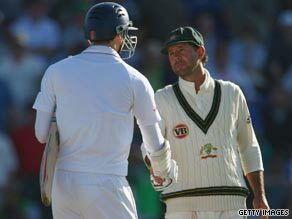 Collingwood and Flintoff then added 57 before the latter gave Ponting his 150th Test catch low at second slip off left-arm quick Mitchell Johnson to leave England 127-6. Stuart Broad made a battling 14 before being trapped leg before wicket by Hauritz at 159-7, then Collingwood gave the crowd something to cheer about when he brought up his 15th Test half-century before tea. He finally lost his erstwhile partner Swann trapped lbw by Hilfenhaus as the Australians took the second new ball, then the former skipper went himself when he steered a delivery from Peter Siddle to Mike Hussey in the gully. Anderson edged Siddle through the slips for four to crucially ensure that Australia needed to bat again, and then managed another boundary from the next delivery before he and Panesar grafted out the final overs under immense pressure.